We have a number of tickets available to the launch of Belfast Pride 2017 and the annual Belfast Pride Awards this Friday in Belfast City Hall. All those successful will be sent tickets from Eventbrite, so please ensure your name and e-mail address are correct. Tickets will be sent out on Thursday evening. 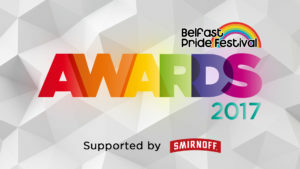 Nominees have been contacted directly in relation to tickets – please ensure you have not already been allocated a ticket through an organisation you are involved with. PreviousPrevious post:Pride Talks Back!NextNext post:2017 Pride Village applications now open!